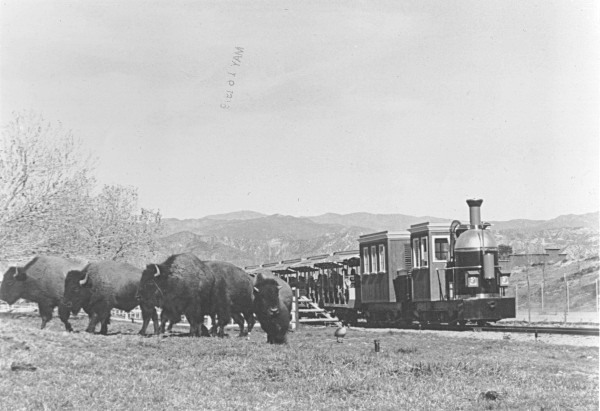 The Grand Centennial Excursion and the buffalo herd in the field out back were icons of Magic Mountain's early years as a Western-themed park, where families could ride into an old make-believe mine shaft via the Gold Rusher, and watch artisans create genuine handicrafts in Spillikin Corners. That was before Six Flags purchased the park and shifted its focus to the "world's tallest, fastest" thrill rides. As seen in this May 16, 1979, photograph, the Grand Centennial Excursion used a small electric locomotive and employed "train conductors," decked out in old-fashioned three-piece black Western suits and bow ties, to take passengers on a trip through time (and through the buffalo corral), with stops at Spillikin Corners and at the northwestern tip of the park where Six Flags would later build "Batman: The Ride." Magic Mountain was an ambitious entertainment project that opened over Memorial Day weekend in 1971 and promptly wrote itself into America's vibrant theme park history. In 1968, executives of Sea World, Inc., were looking for a place in Los Angeles County to build a new theme park. Knowing that The Newhall Land and Farming Company had enough undeveloped land and that the company wanted to attract attention to its New Town of Valencia, a county planner asked company president James F. Dickason if he was interested. He was. After intense negotiations, Sea World and Newhall Land formed a partnership and began to build a 200-acre amusement park at the western edge of Valencia. Seventy acres would be used for the park itself  rides, theaters, games, food, landscaping  and the rest for parking and ancillary services. Ground was broken in January, 1970. When Magic Mountain's wrought-iron gates swung open to the general public for the first time on May 29, 1971, Southern California's most exciting "white knuckler" experience was the Gold Rusher roller coaster, which careened over the hillsides on its distinctive gold-colored track at a breathtaking 35 miles per hour. Highlights of the day were El Bumpo, a bumper boat ride where riders navigated skimmer craft over a lagoon; Galaxy, a giant, double-armed tilting ferris wheel; Billy the Squid, a brightly colored ride with huge, revolving tentacles; and the Grand Centennial Excursion, an old-fashioned narrow gague passeneger train. As technology improved, so did the tastes of park patrons. The thrills of the 1970s gave way to even bigger, faster rides. With Magic Mountain and, subsequently, Valencia, now firmly on the map, The Newhall Land and Farming Company was ready to divest. Newhall Land's final venture into theme park history was the Colossus roller coaster, which opened at the end of the 1978 season. Newhall Land sold the park in 1979 for $51 million  a profit of only $250,000  to Six Flags, a nationally-renowed theme park company which owned and operated five other amusement parks across the nation at the time. Under Six Flags' ownership, the park blossomed into one of the biggest amusement parks in the world. Annual attendance quadrupled in the park's first quarter-century of operation, from 1 million in 1971 to roughly 4 million in 1996. Even after the 1987 incorporation of the nearby City of Santa Clarita, whenever Santa Claritans are asked by outsiders where they live, the most common reply is, "near Magic Mountain." Information from Six Flags California and "A California Legend: The Newhall Land and Farming Company" by Ruth Waldo Newhall (1992).